Bath's Historic Venues comprise the Roman Baths and Pump Room, Assembly Rooms, Guildhall and Victoria Art Gallery. All four venues are in the centre of Bath in the West of England. Bath is 100 miles (160km) west of London and 10 miles (16km) east of Bristol. Bath has good coach and rail connections from London and also from most major cities in the UK. There are coach dropping-off points on North Parade Road and Orange Grove, between the Roman Baths and the Guildhall. These are accessible from North Parade Road. Riverside Coach Park, off Green Park Road, is 3 minutes walk from the centre. Current coach parking charges for Bath can be viewed here. National Express operates a regular bus service from London Victoria, Heathrow and Gatwick airports. The dropping-off point is at the bus station, five minutes walk from the Roman Baths, see pedestrian map. Disabled Badge Holders: There are parking bays for disabled people in a number of locations in the city centre. Please see the attached map for the full list of parking bays, and ask Shopmobility, Tel: 01225 481744, email for the latest details. Bath is an excellent city to visit by rail. The station is called Bath Spa. There are frequent high-speed connections to London Paddington. For a slower and cheaper service try London Waterloo. 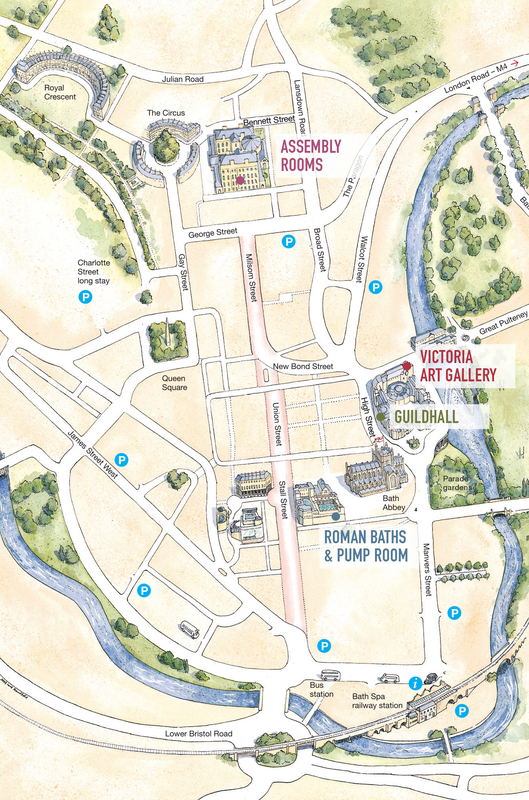 The Roman Baths, Guildhall and Victoria Art Gallery are less than ten minutes walk from the station, with the Assembly Rooms an additional ten minute walk, see pedestrian map. Bath is well suited to pedestrians. Most hotels and guest houses are within easy reach of the city centre. Follow the on-street maps, or print out a pedestrian map.